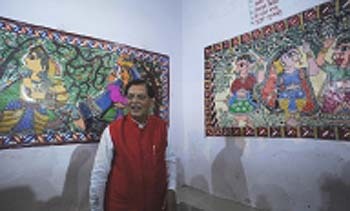 Madhubani, April 7 (IANS) Once looked upon as one of the dirtiest railway stations in India, Madhubani in Bihar now sports a completely different look with Mithila paintings adorning its walls. The rich artistic and cultural legacy of Madhubani region has contributed its transformation to one of the cleanest stations in the country. Mithila paintings are done with fingers, twigs, brushes, nib-pens and matchsticks. Artists use natural dyes and pigments to make geometrical patterns. 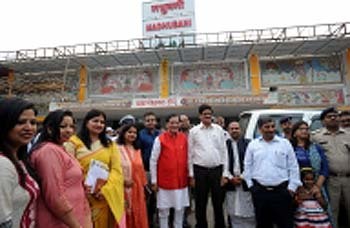 Bindeshwar Pathak, brand ambassador of the Rail Swacch Mission of the Indian Railways and founder of Sulabh International, on Saturday tagged Madhubani as "the cleanest station of the country". Divisional Railway Manager Samastipur R.K. Jain said it was a unique initiative of the Indian Railways to experiment with local artists voluntarily painting the works in a short span of two months. More than 225 artists, 80 per cent of them women, volunteered to paint the station free of cost. "It is a kind of world record as the total wall area of more than 14,000 sq ft has been fully painted with various themes under traditional Mithila painting style, said Gannath Mishra, a senior railway official, who has supervised the project.